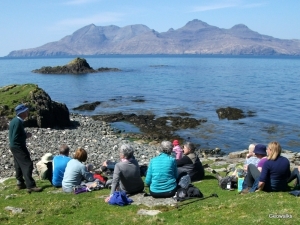 Geowalks Geology Holidays give you the opportunity to visit Scotland’s finest rocks and landscapes, exploring an area in a series of day walks with a small group. A relaxed pace with lots of flexibility. We frequently pause to enjoy the views, the wildlife and flowers and to explore the human stories of the places we are visiting. I’ve been organising these holidays for almost 20 years. There have been more than 75 trips to 17 different locations including the islands of Arran, Cumbrae and Bute, the Cairngorms, Northwest Highlands, Fife Coast, Torridon, Orkney, Shetland and the islands of Eigg and Rum. 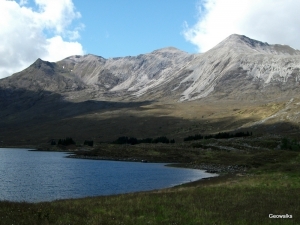 Geology, good food and sparkling company in a large, comfortable house in the Trossachs. Short excursions to local sites of interest, including the fantastic geology of nearby locations such as Callander and Aberfoyle, exploring the Highland Boundary Fault and the Ice Age. Depending on the weather, excursions might last for an hour or two or most of the day, then back to base to relax in front of the fire, with optional short talks and geological discussion: this is a great informal opportunity for a general introduction to geology or to get into more detail of any subject that interests you. This three-day Georetreat will be based at Corshill cottage at Thornhill, a spacious holiday house with a large garden and wood-buring stove. Accommodation, food and geological instruction all included. Cost £190 including guide, accommodation and food, but not including travel (although car sharing can be arranged). Holiday Information Sheet (pdf file). Reaching the places that normal geology trips don’t reach… travelling with the wind, seeing the Hebrides from a different perspective, taking our time to soak up the atmosphere, get in close to the coast to view the geology of inaccessible places and if conditions allow, land occasionally for a wild walk. We can’t guarantee to get there, but the target for this trip will be to go out through the Outer Hebrides and on to St Kilda. Weather permitting! 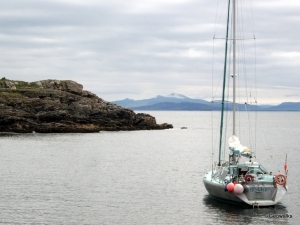 I’m delighted to be working with Celia Bull of Selkie Explorers, based on the island of Eigg and her amazing high-latitude yacht, aluminium hulled with a lifting keel. I’ve sailed with Celia a couple of times now, she is a fine skipper: very experienced, knowledgeable and with a fascinating life story that has taken her all over the world. So, these are unforgettable experiences for a small group. We will set out from Mallaig on Sunday evening and aim to return to anchor off Eigg for the last night, with options of time ashore the next day before departing Mallaig or Arisaig. Book direct with Selkie Explorers – further information. From our base at Kinlochewe we’ll explore the coast and the lower slopes of the mountains, walking 5-10 miles each day on mountain paths and rough ground. Although this is rough terrain, the focus is on exploring the best and most accessible parts of the geological story rather than conquering the peaks! Cost £400 including guide, accommodation & food, but not including travel (although car sharing can be arranged). Holiday Information Sheet (pdf file). Williams GeoAdventures: Scotland Orkney/Shetland Rocks! The Northern Isles of Scotland are wild and beautiful archipelagos with unique prehistoric cultural landscapes that allow us to understand life in these remote regions stretching back some 6,000 years. These are islands where there is a strong connection between the geology, landscapes and people and you get a sense for how people lived in the past, deeply connected to the land and the climate. 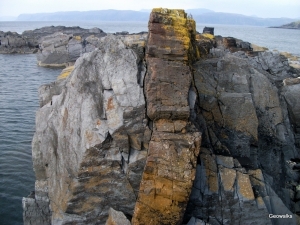 Although at first sight the two island groups are very different, there is a common thread both in geology and culture that runs through this area from the north of Scotland to Scandinavia. Tom Williams and I are organising this trip, further details and booking with Tom at geology-adventures.com. The beautiful and varied Atlantic islands of Luing, Kerrera, Seil, Easdale, Scarba and the Garvellachs have a rich geological history, with fantastic coastal exposures of some of the best of the Dalradian metamorphic rocks and overlying conglomerate, sandstone and lava. The metamorphic rocks contain plenty of clues to what was happening on the floor of a long-lost ocean when the original rocks formed. 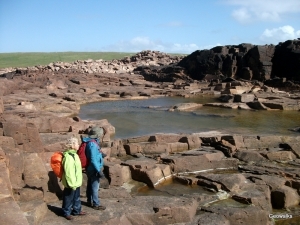 We’ll see slate, limestone and internationally-famous tillite layers within the Dalradian rocks. The structural trend of the rocks creates the grain of the coastline and islands, and the whole lot is shot through by a set of much younger dykes from later volcanic activity on Mull. These islands also have an interesting human history, which intersects with the geology in the many abandoned and flooded slate quarries. Based on Luing, we will experience geology’s influence on the tides, anchorages and the narrow passageways such as the Corrievrekan. Cost £400 including guide, accommodation & food, but not including travel (although car sharing can be arranged). Holiday Information Sheet (pdf file). This year’s Rockwatch Scotland field trip will be to the East Neuk of Fife with Angus Miller – an amazing variety of sedimentary and igneous rocks in a beautiful coastal setting, with sandy beaches and rocky headlands, all easily accessible from our base in Crail. The rocks here formed during the Carboniferous Period, when this area was subsiding slowly in a rift valley. Sometimes the area was covered in warm shallow sea, forming limestone stacked with fossils including crinoids and coral. At other times, this was a low, swampy landscape fed by rivers flowing from the north, with an equatorial climate, lots of vegetation and interesting animals. 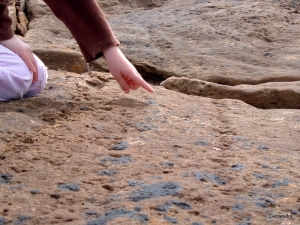 Although the animals themselves are rarely fossilised, they’ve left their footprints in the sand, so we can see trackways left by giant millipedes and an eurypterid. There are also some very impressive volcanic vents and folded rocks to explore. The trip will be flexible and informal, so there will be time to visit different parts of the coast between St Andrews and Elie, all easily accessible by bus from Crail. We can visit interesting beaches, spend time fossil-hunting on the shore, and see a wide range of interesting geological features – and St Andrews is nearby, and there are various castles and museums in the area. We have booked Cailpie House to stay. Email hello@rockwatch.org.uk for further details and to reserve a place. Reaching the places that normal geology trips don’t reach… travelling with the wind, seeing the Hebrides from a different perspective, taking our time to soak up the atmosphere, get in close to the coast to view the geology of inaccessible places and if conditions allow, land occasionally for a wild walk. We can’t plan the detailed itinerary in advance, but there are myriad possibilities setting out from Mallaig with a range of geology ahead of us (rocks dating from 3000 million to just 55 million years old). Possibilities include the Outer Hebrides, Skye, Soay, Col and Tiree, or sail north to the Summer Isles or south to Treshnish, Mull, Iona. We will set out from Mallaig and aim to return to anchor off Eigg for the last evening, with options of time ashore the next day before departing Mallaig or Arisaig. Book direct with Selkie Explorers – further information. Get in touch to see if there are places available, and then send a £50 deposit to secure your place (cheques payable to ‘Geowalks’ or ask for bank transfer details). The final information about each holiday is sent out about 6 weeks in advance, but please ask if you need details to make travel arrangements, etc. Some holidays are organised with partners including Williams Geoadventures and Selkie Explorers, and you book through them – but please don’t hesitate to get in touch if you have any questions.